BMX Bandits were formed in Bellshill, Scotland in 1985 out of the ashes of The Pretty Flowers. The Pretty Flowers featured Duglas Stewart, Frances McKee, Sean Dickson and Norman Blake. When McKee left to form the group that would become The Vaselines and Norman Blake decided to stop making music Stewart asked Dickson to help him record some new song ideas he had. The pair quickly dubbed their new project BMX Bandits as a reference to Stewart's musical hero Brian Wilson, surfing was a big youth trend in 1961 and Wilson didn't surf and in '85 BMX was a big youth trend and Stewart had never been on a bike. At that time Dickson had also started the Soup Dragons and his fellow Dragon guitarist Jim McCulloch was enlisted with a couple of spare friends to fill out the line up. After hearing their first demo Stephen Pastel asked them to record for his new label 53rd & 3rd. Their first single E102 was declared by Sounds magazine as possibly "possibly the worst single ever made" but went on to be number one in the UK indie charts and get mass radio play despite its primitive sound. Dickson soon departed after many violent differences of opinion with Stewart and he was followed by McCulloch. Norman Blake had decided he was missing out on too much fun and returned to making music, forming his own group The Boy Hairdressers and joining the Bandits on drums, moving to guitar after McCulloch and Dickson had departed. The line up was further boosted by multi-instrumentalist Joe McAlinden, 15 year old jazz drummer Francis Macdonald and guitarist Gordon Keen. With this line up the group's music became more sophisticated encorporating jazz chords, Beach Boys inspired harmonies, string and brass arrangements but the band still retained their almost childlike naivety. After 53rd & 3rd disolved the group self financed their debut album, the ironically titled C86 after an NME compilation cassette that they were inexplicably absent from. The album was recorded back to back with Blake and Macdonald's new musical debut Teenage Fanclub's A Catholic Education. The album's highlights include Stewart and Blake's gentle punk anthem Disco Girl and Stewart's Doo-Wop influenced Your Class. Blake started to become very much in demand through Teenage Fanclub (Macdonald left TFC to concentrate on the Bandits) but he didn't want to leave the Bandits. As a solution Eugene Kelly, ex of the Vaselines was brought in as Blake couldn't make all Bandits engagements anymore. Around this time Stewart was invited to tour Japan with a Japanese tribute group backing him on some songs and members of Heavenly on others. A Japanese label Vinyl Japan financed a new album Star Wars that moved further away from just traditional guitar pop and featured songs with a strong folk influence and keyboard led Brian Wilson flavoured pop ballads. Shortly after completing Star Wars the group recorded Stewart's autobiographical tragi-comic Serious Drugs. The song resulted in deals with Creation in the UK, Sony in Japan and Tri-Star in the USA. The song's lyric was misunderstood to be a pro-drugs anthem and it was banned by BBC Radio One but recieved universal plaudits. The mellow soul tinged Serious Drugs was a unique sounding "indie" recording for 1991, an era dominated by either noisy guitars or jerky likely lad pop. Just as it looked liked the Bandits might have finally arrived Blake, Keen and Kelly all officially left the group and things slowed down. New members John Hogarty and Finlay Macdonald were brought in for the recording of Life Goes On and when McAlinden was forced to leave because of a deal he had with rival record label ex-Soup Dragon Sushil K Dade joined the group. The band's now ever changing line up recorded two further albums for Creation Gettin' Dirty and Theme Park. Theme Park, partly co-produced by veteran pop maverick Kim Fowley and Creation Records house producer Joe Foster, was the band's most ecclectic set yet featuring a charming mess of powerpop, electronica, bossa-swing and electro tinged reggae. The album also featured one of Macdonald's and the Bandits' best loved songs I Wanna Fall in Love, a slice of pure girl group pop perfection. The Bandits' left Creation in 1997 and embarked on their first American mini tour with Argentinian samba guitarist Gabriel Telerman and Stevie Jackson of Belle & Sebastian now in the group. After that the group recorded only sporadically for a number of years. Stewart concentrated on producing a music show for BBC television that gave the likes of Cornelius, The White Stripes and Stereo Total their UK television debuts. Macdonald was busy running his own label Shoe Shine Records and rejoined Teenage Fanclub. In 2003 Macdonald and Stewart decided it was time to make a new album. Down at the Hop sounded almost as though it could've been recorded just after Theme Park and not like their was actually almost a seven year gap between the two albums. New members Stuart Kidd, Jamie Cameron and Brian McEwan were enlisted to support the trio of Stewart, Macdonald and Telerman live. The new members were also playing with Macdonald in his solo project Nice Man & the Bad Boys, along with their own band 'St Deluxe with Guitarist Martin Kirwan who also joined the Bandits in the Summer of 2007. In 2004 Stewart started working on a new set of recordings mostly written alone and on most tracks just long term friend David Scott of The Pearlfishers and Stuart Kidd were playing. The bittersweet songs told the story of a lost love with equal doses of sadness and humour. The songs were lived, written and recorded as the experiences were happening to Stewart and so the album took a year to complete. During that year BMX Bandits recorded an e.p. collaborating with YeonGene of cute Korean jazz-pop outfit Linus' Blanket and Stewart co-produced with David Scott YeonGene's solo tribute album to Burt Bacharach, Me & My Burt. 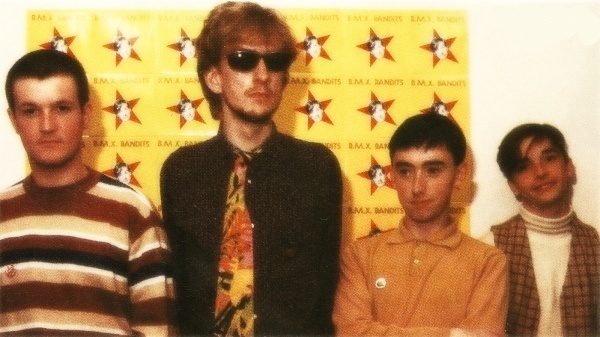 Shortly after completing his personal chain of love songs in the Summer of 2005, now titled My Chain, Stewart asked Macdonald to leave the group as he felt he had a direction he wanted to take BMX Bandits in and needed to reclaim more control of the group's ethos. My Chain was released to the greatest and most uniform acclaim of any Bandits album up to that point. Musically it takes in the stylings of sea shanties, Victorian music hall, Atlantic soul and classic indie pop jangle. Scott, who had contributed to BMX recordings since 1997, now became an official Bandit. Also Stewart found the group's first female member and a muse inspiring a new direction in his writing in the singer Rachel Mackenzie. The first song composed by Stewart for Mackenzie, Doorways, displayed echoes of Carole King, Walt Disney cartoons and Grease / Xanadu era Olivia Newton-John. Stewart described the song's melody as a portrait of Mackenzie in music and said the lyric was him "as a confused teenage girl". The song has been declaired "perhaps Stewart's greatest triumph yet". The new line up with Stewart's new musical husband David Scott and Rachel Mackenzie, "a Nancy to Stewart's Lee and a Birkin to Stewart's Gainsbourg", toured Spain, Japan and played a one off show at NYC POPFEST in 2007. The album Bee Stings, although full of musical surprises, still unmistakably features the band's eternal love of classic pop hooks and Stewart's unique romantic world view. on Creation Records - ?